Disclosure: I got this product as part of an advertorial. I received the product mentioned above complimentary for the purpose of this review. The opinions are my own, based on my personal experience with the product. Do you enjoy hiking, camping or backpacking like we do? You know the big issue though. Weight! Not your own weight but the things you have to carry. You have to keep the load light or you are going to kick yourself. Lightload towels are a innovative, super light towel that are so small, one can fit in your jeans pocket. I love it…I can have my nice soft towel without sacrificing bulk and weight. There are tons of places I am thinking about to bring my light load towel now that I have seen it in action. I can’t wait to go to the beach this summer…forget those giant bulky towels that take up the whole bag. Lightload towels here we come! I can’t think of any other beach towel that could fit in my pocket! The peeps at Lightload gave me some ideas that their past customers have used them for including such innovative uses as a firestarter, face mask, insulation, even an emergency diaper and more. If you have kids, you know that last one could really be a major emergency! I really like that the Lightload towels are super soft against the skin and 100% washable in your washing machine. 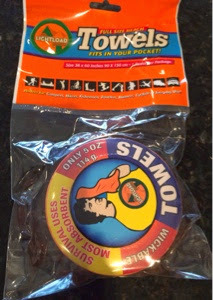 Remembering back to my college student days, these would be great for traveling and staying in hostels…you can feel confident that your personal Lightload towel is fresh and clean. The great peeps at Lightload have provided for me with a sweet giveaway as well. Perfect timing with summer on the way. Don’t forget to get your entries in for a blog sweeps right here. You can win a package of your own Lightload towels by entering here on my Rafflecopter giveaway. Good luck to everyone!